Legendary Asia map goes digital for Ticket to Ride iPad, Steam & Online! Take the mountainous route from Karachi to Kathmandu with Legendary Asia, the first new map to hit the Ticket to Ride digital platforms in 7 years! The Legendary Asia map is available now in several different flavors – as an in-app purchase on Ticket to Ride iPad; from Valve®’s Steam® platform for PC and Mac; and our own browser-based Web Version. Ticket to Ride Europe fits in your Pocket! If you love playing Ticket to Ride on your iPhone as much as we do (okay, we admit we’re pretty biased! ), you can probably picture the route from New York to Los Angeles with your eyes closed. You’ve bested all of the achievements, humbled your friends many times over, and consider Cornelius Vanderbot Jr. to be just a minor annoyance in your quest for rail baron supremacy. We think it’s time to give you a new challenge – Ticket to Ride Europe Pocket! Ticket to Ride is steaming onto the Mac app store with a new Macintosh version that includes solo, hot-seat and online game play on the classic Ticket to Ride USA map. Based on the graphics and design of the successful iPad version, this new Ticket to Ride for Mac also includes in-app purchases for all of the digital maps and game modes released on iPad: USA 1910, Europe, and Switzerland. Small World featured as first boardgame on series premiere of TableTop – Google TV’s Geek & Sundry show. First episode, starring Wil Wheaton as host, debuts today! TableTop is a brand spanking new show that launched today on Google TV’s Geek & Sundry channel and it’s all about boardgames and being oh so nerdy. Naturally, they chose to feature Small World for their inaugural show. So, set phasers to geek. Ticket to Ride iPad wins PocketGamer award! Ticket to Ride for iPad was just awarded the 2012 PocketGamer Award for Best Strategy/Simulation Game! Play Different™ with the new Ticket to Ride Pocket 1.2 – now featuring the USA 1910 expansion as an in-app purchase for your iPhone and iPod Touch mobile devices. The Ticket to Ride 1910 expansion adds 35 new Destination Tickets to the original set and features 3 new game play variants on the original US map – Classic 1910, Mega (with ALL the tickets), and Big Cities which exclusively uses Tickets connected to the US biggest cities. Dale Yu at Opinionated Gamers recently reviewed the two new maps in the Ticket to Ride Map Collection Vol. 1 – Team Asia and Legendary Asia. Not only did he like the new maps, but in a rare show of “bi-partisan agreement” the Opinionated Gamers who commented gave Ticket to Ride Asia a universal thumbs-up! 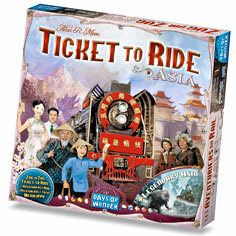 Read the full review of Ticket to Ride Asia at Opinionated Gamers. Now available from the App Store – Ticket to Ride Pocket 1.1 with a new Multi Mode feature that incorporates iOS Game Center asynchronous play support. Available as a free update to existing Pocket users, Version 1.1 of our best-selling iPhone and iPod Touch app now lets you play – and pause – multiple turn-based games of Ticket to Ride. The iOS 5 Game Center lets you play against your friends or auto-match worthy opponents to challenge you.